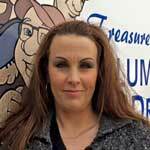 In January 2015, Treasure Valley Plumbing hired a new administrative assistant, Michelle Alaniz. She has been a wonderful addition to our team and has proven to be an amazing asset to the office. She is doing a fantastic job, has great people skills, and speaks Spanish. Michelle was a CNA for the last 21 years and wanted a change in her life. She lives in Payette with her husband, Oscar, and has five children and one grandchild. We are so glad she joined our team here at TVPD. Welcome, Michelle!